Welcome to Marwen is based on the true story of Mark Hogancamp (Steve Carell), who, after a violent attack shatters his body and memories, heals himself through the power of his artistic imagination. He creates a meticulous 1/6th scale town, Marwen, which he populates with doll alter-egos of people from his life, and photographs it to craft a stunning narrative. Oscar-winning filmmaker Robert Zemeckis again shatters cinematic boundaries, employing groundbreaking VFX that put audiences inside Mark’s imagination for 46 minutes of the movie. Bringing the dolls to life was critically important to the visual success of the film. 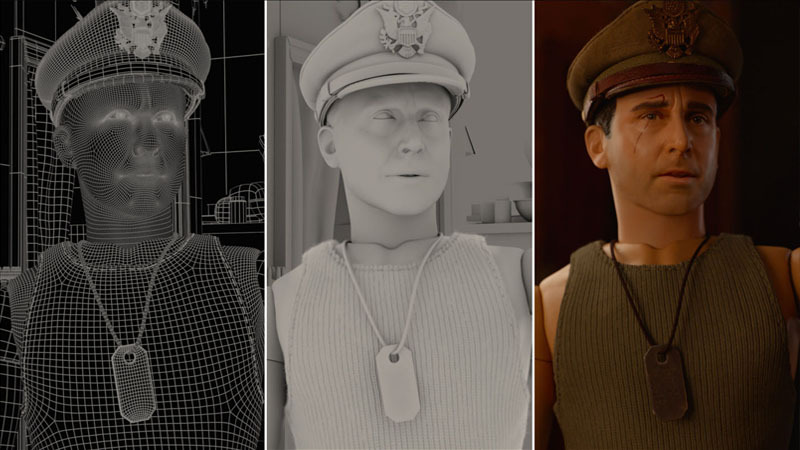 Zemeckis’ long-time collaborator, VFX Supervisor Kevin Baillie and his team at Atomic Fiction (now Method Studios) answered the challenge with never-before-used techniques to deliver stunning performances that seamlessly blend doll and human. Method artists also turned sequences shot in Vancouver into New York City. Along with Method Studios Framestore also worked on VFX for the movie. Steve Carell plays an artist who creates a World War II scenario in his yard with dolls in “Welcome to Marwen. Steve Carell works with director Robert Zemeckis on the set of “Welcome to Marwen.